A teacher who took pupils on holiday and bought them gifts has been banned from the classroom for life. 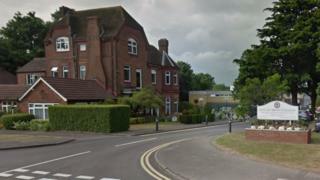 Dr Stephen Jones shared a hotel room with one pupil and also bought alcohol for others between 2014 and 2015 while he taught at St Columba's College in St Albans, Hertfordshire. He was sacked by the school in 2015 after his actions came to light. A Teaching Regulation Agency (TRA) hearing ruled his actions could have brought the profession into disrepute. However, a panel did not find his actions had been sexually motivated. It said Dr Jones had "inappropriate relationships" with three pupils which amounted to "unacceptable professional conduct". Dr Jones joined one pupil and his mother on a trips to Canada and Ireland, and when he went to Italy with the family he invited a second pupil, according to the report. The teacher also took a pupil to the cinema, bought gifts including a "high-value" watch and had been sending students text messages, the panel heard. The panel, which published its decision on Friday, said the RE teacher's actions amounted to "a complete failure of professional integrity". St Columba's said it worked "tirelessly" to ensure young people were "nurtured, valued and encouraged". A college spokesman said: "In May 2015, a staff member was dismissed from our employment because they failed to follow the school's child protection and safeguarding policies and practices. "We have been rigorous in our response to this issue, and have co-operated fully with the TRA in its preparation for this case. We welcome its findings. "It is important to stress, however, that this was an isolated case and the individual concerned was dismissed as soon as it became clear that the high standards that we expect and demand were not adhered to."